This morning I received the following email and article from Jacek A. Rochaki from Poland. I have included Jacek’s email in full as he gives a great introduction to himself. He comments on his English and does not need to as it is very good. 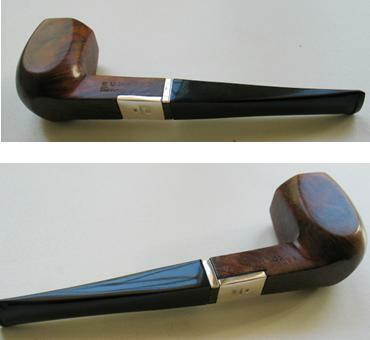 Thank you Jacek for a wonderful article on repairing cracks in briar pipes. My name is Jacek A. Rochacki – Jacek for Friends. I am a retired sculptor, silver and goldsmith, conservator, also author of texts on history, theory and practice of applied art in metal and applied art in general plus on conservation; my second professional “incarnation” is historian of applied art. I have been also teaching these subjects in Denmark and in my native Poland. My imperfect command of English has prevented me from writing much, but my sincere wish to help in repair/restoration of pipes and thus saving them has prompted me to write some remarks with hope, that you will kindly forgive my eventual linguistic mistakes. Let me say that this text in much shorter form has been already published in English-speaking pipe-internet, unfortunately it somehow disappeared so after revision I decided to make the second edition. I should also say that it should be rather written in past tense, not in present tense, as I am not anymore active in my studio. 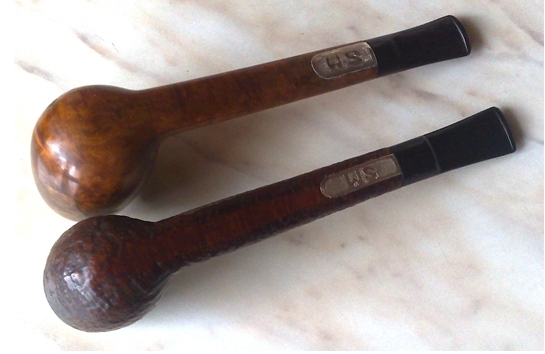 Cracks and/or splits in the stem and in the bowl of briar pipes are often repairable; let me indicate step by step how I have been dealing with such problems. Let me begin by dealing with cracks in the bowl. 1. On the very end of the crack/split the tiny hole should be drilled by a drill of, say, 0.5-0.6 mm in diameter. But kindly keep in mind that this hole should not go through the wall of the bowl just should be drilled deep enough to serve as “stopper” preventing the crack/split to continue. This is an old technique known to woodworkers and restorers/conservators knowledgeable in techniques, tools, workshop of applied art objects. In case of the bowl (or shank) of briar pipe it is not necessary to use the drilling machine but you can twist the drill bit with your fingers. 2. Delicate but thorough cleaning of the crack/split in order to remove any sort of dirt, especially to degrease the crack/split itself and the adjoining/neighboring area. I often use “pure” alcohol, say, 98-99%. Then the cleaned bowl should dry for a period of, say, two-three days. 3. 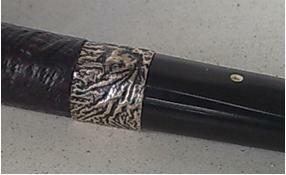 When the crack/split and the adjoining area of the briar is clean and dry, I simply use the properly chosen glue. Some sources recommend the cyano-acrylic glue, possibly in the consistency of gel rather, then in very liquid form. I was told that so called Super Glue should do the job, but I use a two part epoxy resin with a hardener, which meets two conditions: it is heat-resistant, and it creates a “flexible” joint. 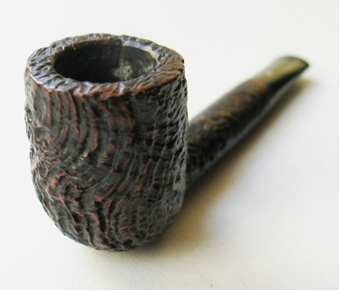 This is important because during thermal operations (pipe smoking) the briar “works” – gets larger and smaller according to the change of temperature. The two part epoxy resin which I use, according to the representative of the manufacturer of this glue will be “working” – getting larger and smaller when “exposed” to change of temperatures in a way similar to briar. This very glue – as I’ve been informed – is heat resistant up to 200 C/392 F. Unfortunately I was given the epoxy as a gift in two small samples and not the original jars, so I can’t give more precise information. All I know is that the manufacturer is Chester Molecular Company. So when I have the glue ready, I apply it into the crack/split as deeply as possible; the experienced restorer, “clever with his hands” may even try with utmost possible care to split the crack a little wider in order to let the glue penetrate as deeply as possible. Here I do not have to mention, that it is an extremely risky operation, because the widening of the split may cause the bowl to break! When the glue is applied, you have to press the glued bowl in order to let the glue do its job. I often place the glued bowl (wrapped in some soft textile, leather or felt in order to prevent damage of the surface) in a vice jaws and carefully apply the force; a simpler method would be just to use thread wrapped tightly several times around the glued briar. I let it sit for rather long time to dry thoroughly – details should be provided by the glue manufacturer. a. A pre-polish paste/material (like German Menzerna, or other modern equivalent of traditional Tripoli compound). b. A”white” polishing material (like White Dialux (ed. White Diamond in North America). c. Carnauba wax/resin, known to the pipe world does the job well. 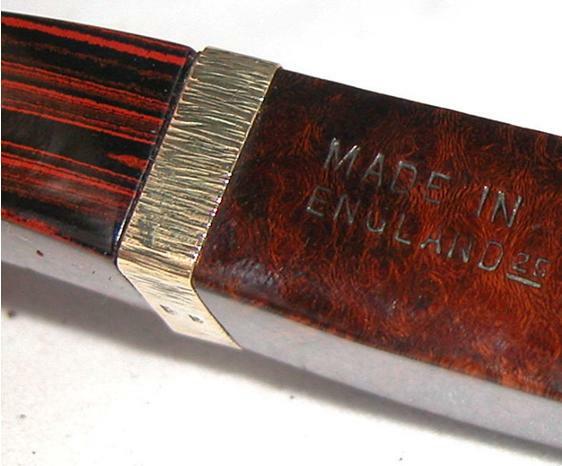 In many cases it is enough; typing this text I am smoking my Dunhill ES Shell Briar, vintage 1967 which came into my possession with a bowl severely damaged, and since I applied the procedures described above it smokes perfect, with no signs of reappearing cracks that are repaired. But in some cases it would not be amiss to enforce the glued bowl by applying the element of metal – possibly of silver of high quality – a ring. In some cases it would make sense to create not just a top ring/band but whole “cap”, sometimeswith metal “mustaches” that will cover and enforce the fixed cracks. Continuing the topic of repairing cracks or/and splits: I know about different metal – often silver – elements, used in repair procedures. They are used mainly in order to re-enforce the construction/structure weakened by the crack/split/mechanical damage, and to mask the place that has been damaged as well. This simple sentence/statement should be a topic for longer explanation; let me just say, that “silver” – more precisely: the two component alloy of silver and copper is recommended because of its softness – thus it has a better ability for three dimensional forming – but it is also (unfortunately) a good conductor and “keeper” of heat. So I would keep this in mind, and always take this under consideration, when thinking on using large portions of silver element to be fixed on the surface of the bowl. 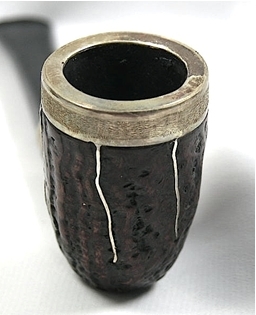 The wrong distribution of the heat may result in a burned/charred smoking chamber at the place, where the fairly large piece of the “heat keeper”=silver element is permanently fixed on the outside of the bowl. I say this with regard to what I read sometimes on the internet about the usage of metal – maybe silver – fairly large elements in the process of repairing such or similar damages. I believe that we should pay attention to the kind of silver – silver alloy employed in the repairing process. Remember, that the higher amount of pure silver (or gold) in the alloy, the easier the process of forming will go (of course after proper “softening” which goldsmiths and silversmiths call annealing). So I am a smith, who, for dealing with many cases, instead of using “Sterling Silver”, so common these days which is an alloy of 92.5% of pure silver and 7.5% of copper, will go for “old fashioned” alloy once popular among British top silversmiths, named Britannia Standard and which consists of 95.8% of pure silver. For some purposes I would use even pure silver plate or elements like clasps, because of the absence of copper prevents the “bad” chemical processes which may eventually trigger out, when elements containing copper contact with condensate and make foul taste in a carelessly repaired pipe. The higher amount of pure silver or gold in the alloy, the more such alloy is usable for forming. I mentioned clasps. 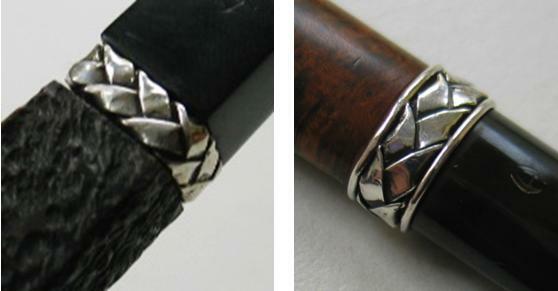 I use them often when repairing long cracks/splits in the shank of a pipe, especially at the bottom of Canadian shaped pipes, when the use of “traditional” silver or gold band would cover part of the signature or, because of technical reasons I do not want to go over the whole area of the shank at the repaired area. I want to avoid intrusion into the markings area at all costs as I am an applied art conservator. But sometimes it is impossible to make a repair band with sort of “windows” showing the signature – the whole area or part of it. I put strong accent on this aspect as signatures/markings must never be masked/covered/destroyed, like in restoration of other objects of art. I make my clasps usually of 0.4 mm in diameter pure silver wire and I place them in specially elaborated/carved grooves/”nests”, always keeping their tops at the level of briar surface of the repaired area. Then I usually cover the area repaired in such way with very thin (0.3-0.4 mm) plate of silver, leveled up to the surface of the outer briar area at repaired place. This entry was posted in Pipe Refurbishing Essays and tagged banding, Banding a cracked shank, Jacek A. Rochacki, Jacek A. Rochacki articles, making a silver band, pipe refurbishing, repairing a crack with epoxy, repairing a cracked shank with wire clasps, Repairing Cracked shanks, repairing cracks in exterior of the bowl on February 24, 2014 by rebornpipes. Thank you for your generous giving…you have a mentor’s heart and I am most appreciative of your time and effort. These insights will be most helpful. Jacek, thank you so much for sharing your techniques with us. Steve, thank you for bringing this artist to our attention. What an artistic approach to remedying a dreaded problem. Thank you both. Dave – thank you. It is real pleasure to see and feel that my several sentences and few pictures are of good use for Fine People gathering around this place in the internet ! Jacek, you clearly bring a whole different level of detail to the repair of pipes. I have long felt like a craftsman and your clearly artistic solutions point out just how far I have to go to achieve the next level in our craft. Please do give us further detail as to the materials and processes you have developed and applied to pipe repair. I look forward to future posts you might make on this Blog. Chuck, you are too kind 🙂 When I’ll feel better I’ll try to write some more of my “remarks”. 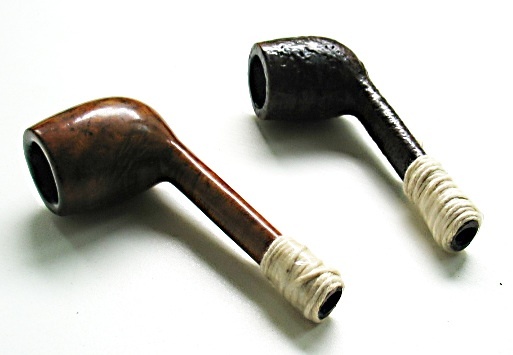 Here I would like to say that as a matter of fact I have nothing new to say; the new thing – as I begin to understand – may be just the approach to subject of smoking pipes restoration from the point of view of conservator of applied art. Theory and practice of conservation, restoration etc is taught in (academic) schools all over the world. Surely we do not have to make B.A or M.A. in conservation, all I am trying to say is suggesting getting familiar, learn a little about the professional/academic “conservator’s way”. I am aware that we are so called “amateurs”. Many decades ago I was familiar with an international project on future of handicraft. In our contemporary world classic handicraft does not make economical sense, but it should survive as testimony of our culture identity, continuity, preserving our human cultural heritage. One of results of that project was a number of programs addressed to so called “amateurs” as they are not forced to make their living from the craft performed as noble “hobby”, thus they do not feel economical pressure (time is money) and have a chance of mastering what they do. Thank you dearly for your too kind words. 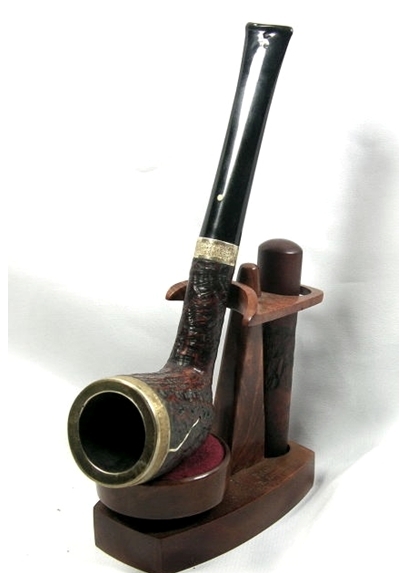 In my attitude toward pipe repairs helped me much my background not just of being sculptor and goldsmith but also as person active in history of applied art and conservation, thus understanding importance of minimal “invasion” into the “body” of original object. All kind of markings are so important when we try to attribute and date certain object so I am always pointing out that they will remain intact/readable. 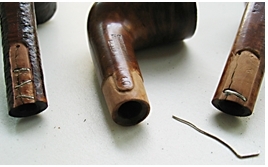 What innovative and elegant solutions to common pipe failures. The “windows” used to allow the full nomenclature to be viewed is another amazing solution. Thanks for sharing your work on the blog! Jacek you do some amazing silver work. I have learned much just reading your article. Thank you for allowing us to put this on the blog. It is a pleasure to have you write for us. I hope that you present other articles on your work in the future.